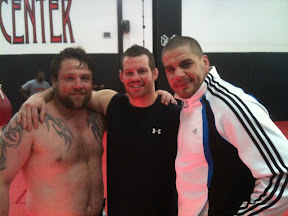 Here I am with James McSweeney and Jeremiah Constant after sparring today. Big Shane looks great and ready to go! Now I'm headed home to eat. Also, Saturday I will be doing the question and answer event just before the weigh-ins.